When you are looking to generate impact with an audience, create a relaxed and happy atmosphere, and create memories that your employees or customers will carry with them, why not put a bit of magic into their lives? The magical combination of mystery, illusion, suspense and humour never fails to gather up an audience and provides a focus for your special corporate event. When Smith Kline Beecham flew Mel Harvey out to Amsterdam they knew that their clients were going to get a little extra something in their hospitality package. From onboard entertainment, cruising to the evening venue, to the table magic at the Gala dinner, Mel worked his magic, generating a memorable feelgood factor - essential in establishing long term business relationships. When launching their mainstay range model, Vauxhall turned to Mel to provide product related close- up magic. In supporting a dramatic reveal of the new Vectra, Mel was able to use themed illusions to add intrigue and suspense to a significant occasion for this major motor manufacturer. And what about a Fun Day for all the family? Engaging the interest and enthusiasm of all family members of your employees is a powerful motivational force. If you are committed to training, rewarding, nurturing and retaining your workforce, then staging your own corporate light entertainment show can be an effective and memorable approach. From straight illusion to Panto to comedy magic specials with Costume Characters, even Punch and Judy Mel has the range to deliver a professional and slick event that will set families talking for months ahead. These are just some of the ways Mel can provide your corporate events with a unique and memorable point of difference. Get in touch with Mel to explore an especially tailored proposal for your next important occasion. Planning a stand at an exhibition? Then you're primarily interested in "footfall" and "crowd stopping". So consider the impact of putting Mel on your exhibition stand for the day! 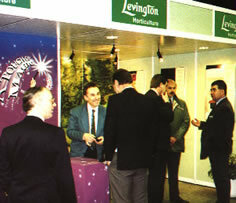 Levington's successfully used Mel at the Harrogate Exhibition Centre to add impact to their exhibition presentation, performing close up magic to entertain delegates whilst affording company representatives extra time to engage with many more delegates.